Fluorotherm™’s Immersion Coil Heat Exchangers have been proven worldwide in a vast range of applications since 1965. Ruggedness of design, a vast experience base, internal control of all aspects of specifications and manufacturing, and unmatched technical support are the key reasons behind customer loyalty over the decades. Fluorotherm™ heat exchangers possess corrosion resistance second only to diamond (which is nature’s most perfect material). Its non-stick characteristic resists fouling and maintains heat transfer efficiency over its lifecycle. Fluorotherm™’s design provides the largest tube-to-tube spacing, thus assuring uniform heat transfer between the steam and acid. This feature reduces the possibility of scale build up and clogging (to form hot spots), which can damage the tubing over time. Therefore both our materials and design prevent thermal degradation. Most importantly, Fluorotherm™ heat exchangers do not have a single tubing weld joint. Plastics weld joints are notoriously weak spots that are the first to fail due to heat and mechanical stress. We offer tube repair kits in the rare case of tube damage. This repair can be conducted on site without the need to either send it back or replace a part. All of these reasons contribute to a long lifecycle – a feature that alternative heat exchangers do not provide. The design elements used in our construction consist of several safety factors to ensure that performance is not compromised when used properly. This translates to the lowest cost of ownership in the industry – the amount that includes the initial purchase cost as well as the cost of operating the heat exchanger after it is properly installed. Due to this, we have retained a high degree of loyalty among our customers – some major ones have remained with us since the 1970’s. Our heat exchangers have evolved considerably in design and new materials. Currently, Fluorotherm™ carries over 800 basic design variations, which are applicable to most situations. However, non-standard or existing applications that need a retrofit can also be fulfilled by custom heat exchanger designs offered by Fluorotherm™. Contact us today to find out more. 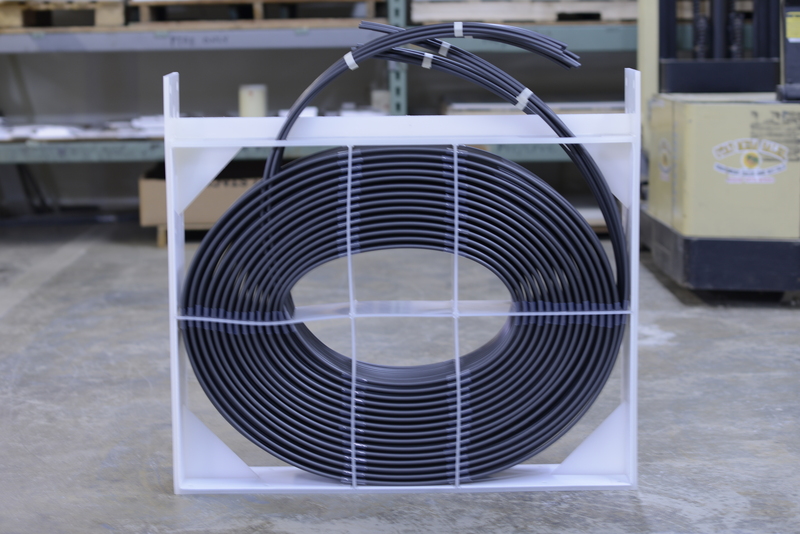 Fluorotherm™’s materials of construction for the Immersion Coil Heat Exchanger consists of either polypropylene, PVDF, or PTFE for the frame, and either FEP, PFA, or PTFE for the tubing. Custom designs may include other fluoropolymer materials such as ETFE, ECTFE or PCTFE. 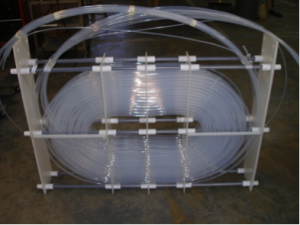 No tube bundling - The strong tubing coils are optimally spaced so acid flow and therefore heat transfer is maintained without fouling. Fluorotherm™ manufactures H2 conductive tubing coil heat exchangers for use in restricted spaces in new and retrofit applications. This product provides between 2.3 to 2.7-times the heat transfer capability of clear, natural tubing coils. The heat transfer rate is similar to steel without the corrosion attack susceptibility. It is also used in baths where electrical static discharge is a major concern. This product has undergone several iterations of improvement in properties and is unique to Fluorotherm™’s line of heat exchanger offerings. Fluorotherm®'s hybrid frame heat exchangers were made specially for ultrapure and aggressive chemical heating and cooling. This new product combines the best components and design geometry for efficient heat transfer. The design, evolved from decades of field experience, is driven by the need to inhibit particulate settling on, and fouling of heat transfer surfaces. These particles (sludge and precipitates) fall out from the chemical reactions that occur during metal treatment in mineral acids, in the form of oxides, sulfates, chlorides, phosphates and other materials. The particle buildup over time, coats surfaces, or worse, causes serious damage to the heat exchanger, interrupting processes. At a minimum, this results in reduced heat transfer. Exotic alloy metal heat exchangers are difficult to maintain due to rapid particulate, foulant or sludge build up during use. They are also expensive to repair. The hybrid design eliminates flat surfaces upon which the salts can settle. In addition, the materials of construction have a much lower surface energy surface than metal or other plastics, thus inhibiting particle build up. Both of these features have been brought together in an optimized fashion in our new hybrid design. The hybrid heat exchanger provides a large between-tube spacing, for free and unrestricted fluid flow. It allows intimate contact between the fluid and the hot or cold heat exchange surfaces, resulting in maximizing heat transfer efficiency.